As a result of its outstanding support for renewable energy in Michigan, Irwin Seating Company in Grand Rapids has been awarded the “Green Generation Customer of the Year” award from Consumers Energy. The Green Generation program provides our customers an opportunity to voluntarily demonstrate their support for renewable energy in Michigan. Irwin Seating Company purchases nearly 700,000 kilowatt-hours annually of Michigan-based renewable energy for its corporate headquarters and manufacturing facility in Grand Rapids. Since joining the Green Generation program in 2006, the company has purchased more than 4 million kilowatt-hours of renewable energy. Irwin Seating is the largest participating manufacturer in the Green Generation program in Michigan and is the third-largest overall participant. “Irwin Seating Company is proud of its long history of environmental responsibility, and is happy to have the opportunity to partner with Consumers Energy’s Green Generation program,” said Win Irwin, President and CEO of Irwin Seating Company. “We commend Irwin Seating Company for its leadership and commitment to Michigan‘s environment through its voluntary participation in the Green Generation program,” said Thomas Shirilla, Consumers Energy’s program manager for Green Generation. The Green Generation program, with nearly 16,000 customer-participants, was the first voluntary renewable energy program in Michigan. It was launched in 2005 following authorization by the Michigan Public Service Commission. More than 100 organizations are enrolled in the Green Generation program including the City of Grand Rapids, Grand Rapids Community College, The Green Well Restaurant and the University of Michigan -Flint. 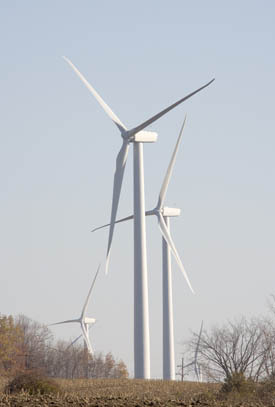 Green Generation has led to the development of several renewable energy projects in the state, including the Michigan Wind 1 park in the Thumb region. Other Green Generation projects include biomass facilities located near Birch Run, Lennon, Marshall and Zeeland. We also purchase electricity for the program generated by two wind turbines near Mackinaw City. All of the projects are located in Michigan’s Lower Peninsula and all sources are Green-e certified as renewable.